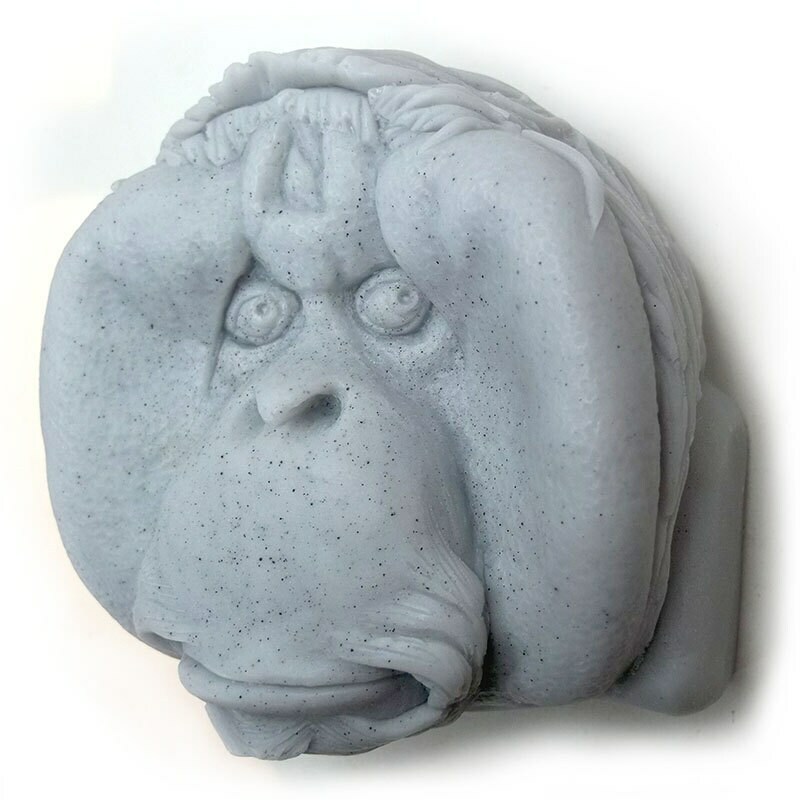 Here is our first of several primates we are planning to offer in our catalog. This expressive appearance is sure to get some attention. It has a subtle skin texture along the cheek pads and detailed head. It is delicately scented using a low sweat vegetable base. The natural oils use to make this is smooth and creamy to use while it nicely achieving a soothing lather. Please select from the 6 color / scent combinations using the drop down option. The soap bar itself is 3" wide x 3" deep x 2" high. It arrives to you packaged in it's own 3"W x 3"D x 2"H natural color cardboard gift box, bearing a simple white label on top, wrapped with natural raffia. This individually packaged item in a small corrugated box weighs 10 ounces. For all in support of sustainable palm oil sourcing, we also offered our 8 ounce Orangutan soap in a PALM FREE version. For just 45 cents more, the soap base is made using the four following pesticide free organic ingredients, and is available only in the color orange with a pineapple papaya scent. Please select the Orange / PALM FREE option from the drop down menu above. Almond - A lovely moisturizing oil that is very light and absorbs well. This sweet oil is known to help in hair care, and skin care (psoriasis). A rich source of vitamin E, calcium, phosphorous, iron and magnesium and contains zinc, selenium, copper and niacin. Almonds contain the most nutrients in comparison to all other nuts. Castor – A thick, clear oil that helps increase the lather in soap for a rich, creamy lather with thick, large bubbles. This oil acts similar to glycerin, as a humectant, drawing moisture to the skin. Coconut – This gives a tremendous, bubbly lather to our soap. It is an effective moisturizer on all types of skin for preventing dryness and flaking, has antioxidant properties, helps in treating various skin problems including psoriasis, dermatitis, eczema and other skin infections, helps in re-growth process of damaged hair and gives hair a shiny quality. Olive - This extra virgin oil gives a rich feel to the soap.